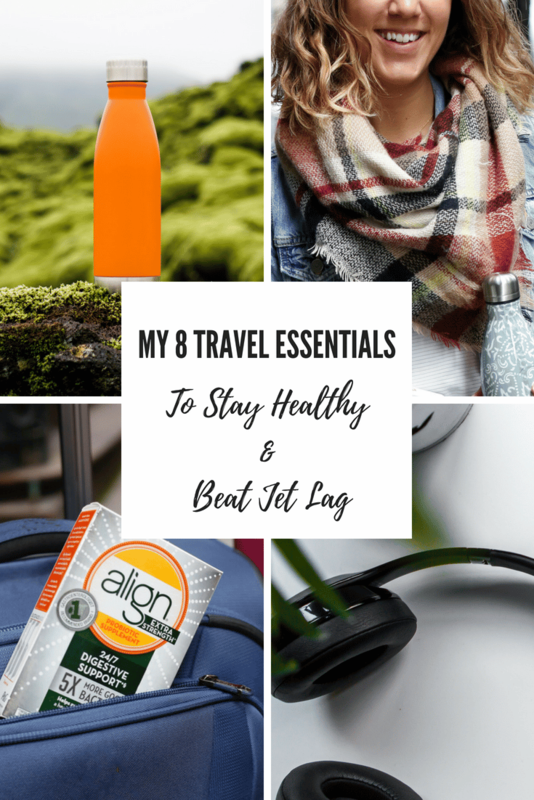 As a frequent traveler, my suitcase always includes several essentials that help me stay healthy, avoid jet lag, and maintain my routine no matter where in the world I am. Here are my tips on what to pack in order to beat jet lag and how to stay healthy while traveling. This post is sponsored by Align Probiotics. I was compensated for my time, but as always, all thoughts and opinions are my own. Over the course of 2017, my (insane) travel schedule meant that I spent six out of the 12 months living out of a suitcase. I’d have a week or two between trips, then it was right back on the road. I visited Colombia, Iceland, Spain, Portugal, Denmark, and Sweden, along with trips to Florida, California, Arizona, Chicago, and Texas. Now don’t get me wrong, traveling and seeing the world is really amazing, but being on the road so much comes with its own set of complications. When I first began traveling frequently, my self-care routine took a hit. I was sleeping poorly, getting sick, feeling run-down, and all-around felt off schedule. Over time, and through a bit of trial and error, I discovered several travel essentials that have made a huge difference. 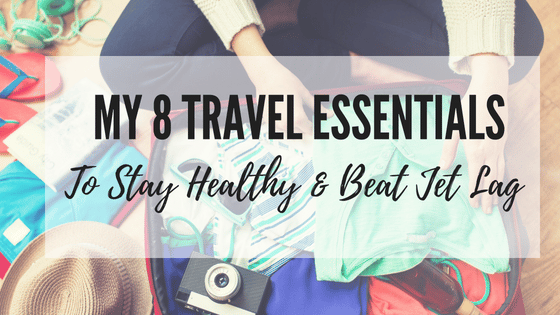 Now I pack these eight items every time I travel, as they help me stay healthy, avoid jet lag, and maintain my routine no matter where in the world I am. Airplane travel can dehydrate you, and dehydration makes jet lag – and your chances of getting sick – worse. I hate paying for bottled water, so I bring a refillable water bottle with me (just make sure it’s empty before you go through security). I fill it up on my way to my gate, then again right before I board the plane. On board, I take water from the flight attendants every chance I get and use that to continue to fill up my bottle. I also avoid both caffeine and alcohol, as these can both disrupt your sleeping schedule and may further dehydrate you, worsening jet lag. Once I get to my destination, having the water bottle on hand helps ensure that I continue to drink plenty of water. One of my biggest fears is being caught in the middle of a long flight, hungry and with nothing to eat. I always bring along some of my favorite snacks including nuts, beef jerky, dried or fresh fruit, raw veggies, Greek yogurt, or single serve packs of hummus. If I’m switching multiple time zones, I try to eat on the schedule of wherever I am headed. This tricks my brain a bit and helps me feel less jet lagged once I land. For longer flights I try to pack a larger meal. While I’m always a food-first dietitian, I do think there are a few occasions where supplements can come in handy for some people. I take a few per day and while I don’t bring all of my supplements along for my travels, there are two that I always pack: probiotics and vitamin C. Travel and changes in routine can disrupt the natural balance of good bacteria in our bodies so a daily probiotic is always a must for me. I’ve been taking Align Extra Strength probiotic daily, which contain 5x more good bacteria than Align Probiotic. Align supplements the digestive system with good bacteria, which helps maintain digestive balance. * Another plus: Align comes in blister packs and doesn’t need to be refrigerated, so it’s easy to toss into my suitcase. I also take daily vitamin C, as there’s some evidence that shows that daily use may prevent getting a cold and decrease the duration if and when you get sick. I’m not typically a germaphobe, but when I get on an airplane I don’t take any chances. Planes are full of germs and are an easy place to catch a cold or a stomach bug (not fun on a normal day, let alone during a trip). I bring at least one bottle of hand sanitizer and keep it close at hand (no pun intended). After this year’s bad flu outbreak, I also started bringing sanitizer wipes, using them to clean off the tray table and armrests as soon as I sit down. I may get some weird side-eyes from my seatmate, but avoiding getting sick is worth it. Airplane temperatures can be all over the place. Sometimes I’m sitting in my tank top all flight, other times I’m bundled up like a snowman. Just in case, I always toss a cozy scarf and thick socks in my carry on bag. Lately I’ve been bringing a really long scarf, as it can double as a blanket. Because I don’t know about you but if I’m even a little cold, there’s no way I’m getting any sleep. While I’m not a big airplane movie watcher (all this travel means plan time = work time, so I can enjoy more of my time on the ground) I always pack a set of headphones. Listening to music or podcasts helps me feel more “at home”, and I’ll often use them to do a guided meditation prior to landing. And if I’m on a red-eye, I always turn on a white-noise machine app. This (plus the noise canceling headphones) blocks out any ambient noise from passengers or crew and allows me to get a more restful nights sleep (as restful as I can in an upright seat anyway). I always wear a watch when I travel, since I can set it to the time zone of the place I’m flying to as soon as I sit down on the plane. This helps me get into the mindset of the time zone I’m heading to, and gets me on track with that time much quicker. Since the time on my smartphone doesn’t change until I land, I try to avoid using it to get the time. I’m one of those crazy people who will wear an eye mask even if I’m going to bed when it’s dark, and waking up before sunrise. But – even if I wasn’t one of those – I’d still always travel with an eye mask. It’s especially important on overnight flights to ensure I get a decent night of sleep (there’s always that one person who cracks the window shade at 3 am). The eye mask is also helpful if you’re traveling somewhere that stays light until late at night, or where the sunrise is much earlier. Any ambient light tells your brain it’s time to wake up, so the more of that light you can block out, the better. What are your travel essentials? Let me know in the comments below!